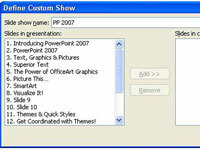 On the Slide Show tab on the Ribbon, click Custom Slide Show in the Start Slide Show group, then choose Custom Shows. The Custom Slides dialog box opens. Type a name for the custom show in the Slide Show Name field. Choose a name you’ll remember later. 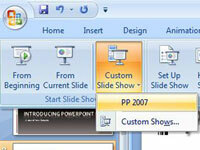 Add the slides that you want to appear in the custom slide show. 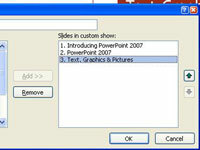 Click the slide that you want to add in the list box on the left side of the dialog box and then click Add. 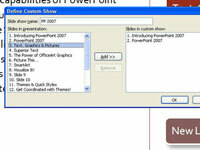 The slide appears in the list box on the right side of the Define Custom Show dialog box. To remove a slide, click it in the list box and click Remove. 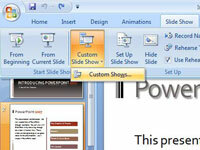 (Optional) Use the up or down arrows near the right edge of the Define Custom Show dialog box. Change the order of the slides in the custom show. 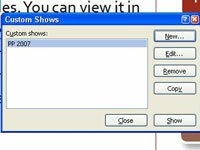 Click Close to dismiss the Custom Shows dialog box. Your custom show is ready to use.